Hyper-homocysteinemia is a risk factor for coronary artery disease in young patients. A 32 years old female without any conventional risk factors except obesity presented with acute anterior wall myocardial infarction (MI). Her echocardiography showed anterior wall hypokinesia with moderate left ventricular dysfunction. Angiography showed tight stenosis of the proximal left anterior descending (LAD) and borderline lesion in left circumflex coronary artery (LCX). 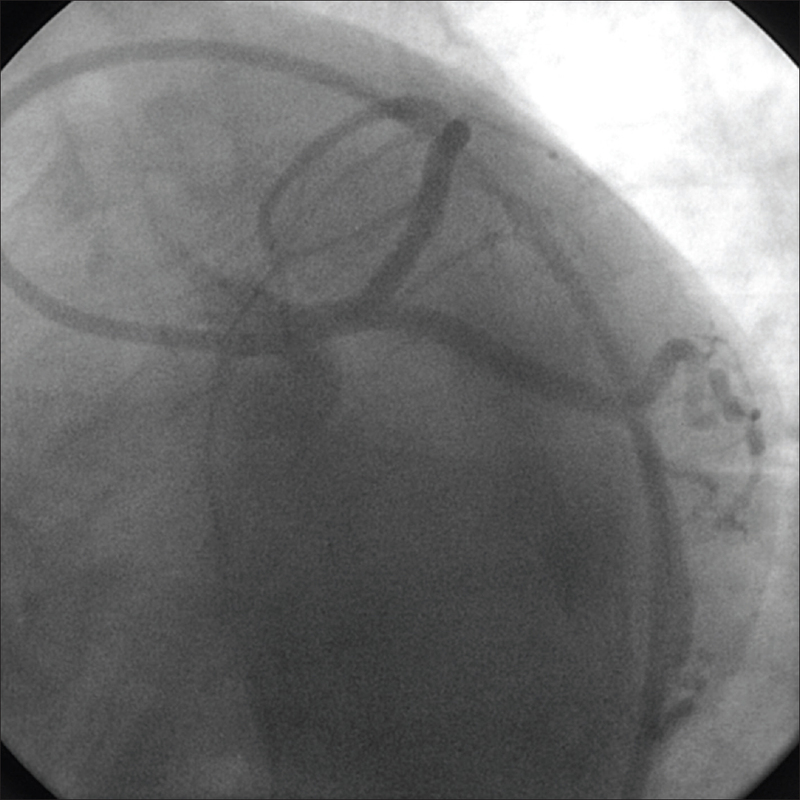 She underwent percutaneous coronary intervention (PCI) to LAD with good result. Her blood tests showed low vitamin B12, folate and serum iron levels and elevated serum homocysteine level. She was given folic acid and vitamin B12 and her homocysteine levels normalized. This case demonstrates that hyperhomocysteinemia caused by nutritional deficiency of vitamin co factors may lead to MI. Hyperhomocysteinemia should be considered in the evalauation of young people with MI, especially those without conventional risk factors. Hyper homocysteinemia is an independent risk factor for coronary artery disease and myocardial infarction (MI) in young patients. Most of the relationship between homocysteinemia and arterial vascular diseases and venous thrombotic diseases is epidemiologically based. Homocysteine deficiency can be genetic, acquired or a combination of both. In the classical form of the disease there is deficiency of the enzyme cystathione beta synthase, which converts homocysteine to cystathione in a reaction that uses vitamin B12, B6 and folic acid. Elevated plasma homocysteine levels have been widely studied as an independent risk factor for atherosclerosis. A large body of data indicates consistent relationship between plasma homocystein levels and atherosclerotic vascular disease involving coronary, peripheral and cerebral circulations. 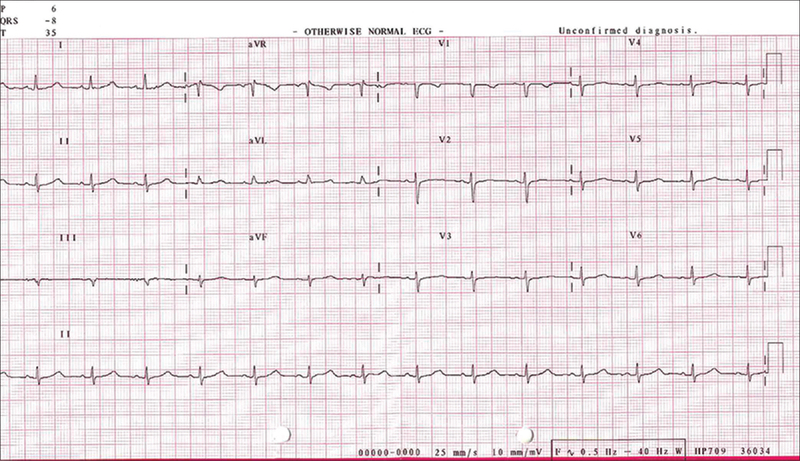 , This case reports a young lady with acute MI and an elevated serum homocysteine level. Her hyperhomocysteinemia was associated with vitamin B12 deficiency possibly nutritional and this has responded to treatment with vitamin supplementations. A 32-years old female has presented with history of recurrent chest discomfort and left shoulder pain for 2 days. She has an acute stress at home regarding the health of her child and the symptoms started following this emotional outburst. The pain was not associated with sweating, shortness of breath or syncope. There was no past history of heart disease nor other conventional risk factors for ischemic heart disease like diabetes mellitus (DM), hypertension smoking, or illicit drug use. She has a history of gestational DM during her last pregnancy and has amenorrhea for 6 months. She was on diet and exercise regimen to lose weight since 6 months. On physical examination she was obese with a BMI of 34 kg/sqm 2 . Her physical examination showed normal heart sounds and normal blood pressure. 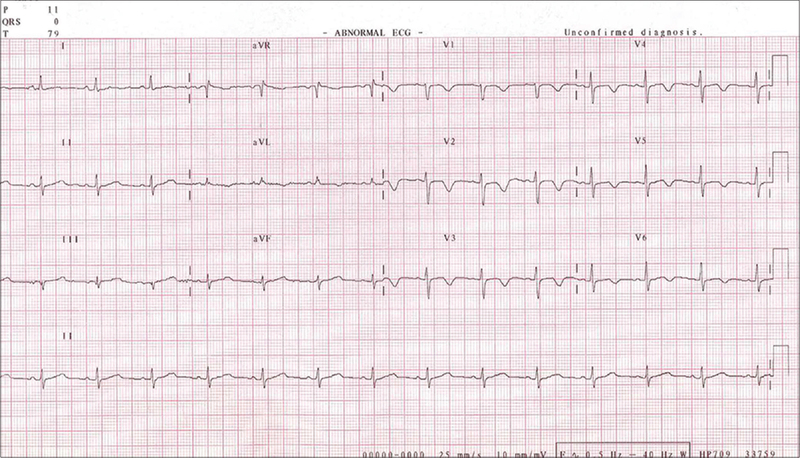 An electrocardiogram (ECG) was taken and it showed sinus rhythm with symmetrical T wave inversions in leads V1 to V6. [Figure 1] Cardiac troponin I which was 0.62 ng/ml (normal < 0.04ng/mL) at presentation peaked to 6.38 ng/mL subsequently normalized after 1 week suggestive of MI. She was treated with aspirin, clopidogrel and enoxaparin injection in the emergency room. Her echocardiography was done and it showed hypokinesia of the mid and apical anterior septum and anterior wall with moderate left ventricular systolic dysfunction. She was taken up for coronary angiography on the next day. Her coronary angiography showed 75- % stenosis of the proximal left anterior descending coronary artery (LAD) and 50% lesion in the left circumflex coronary artery. 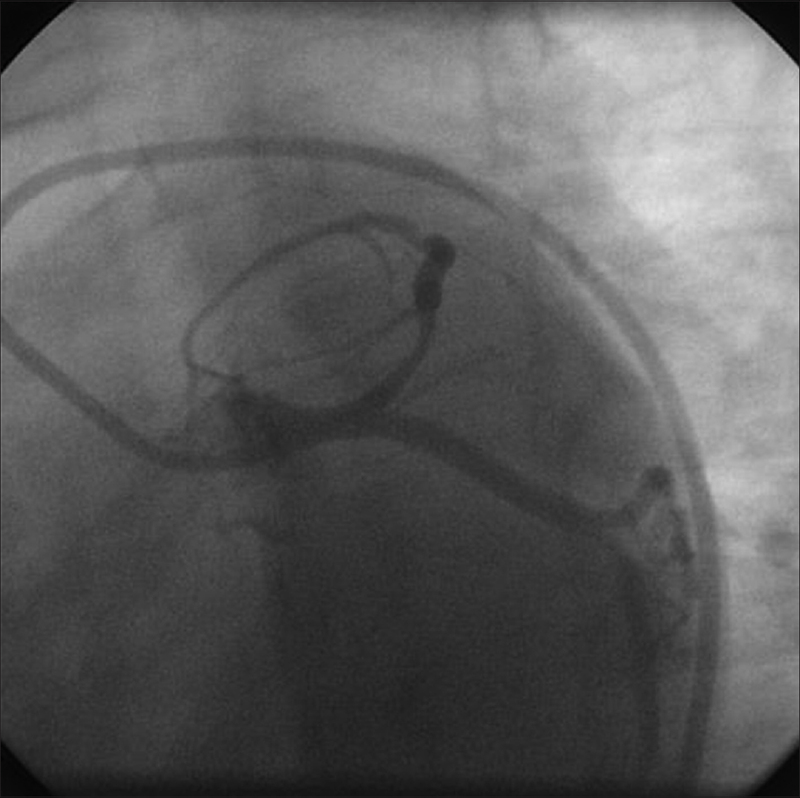 (LCX) [Figure 2] She has undergone angioplasty and stenting to LAD with good result. [Figure 3] She remained pain free after the procedure. Serial ECGs showed normalization of the anterior wall ischemic changes [Figure 4] and normalization of the left ventricular function on follow up. Routine blood investigation showed anemia with hemoglobin of 11g/dL with microcytic and macrocytic red blood cells (RBS) with hypochromia. She was evaluated for cause of anemia and it revealed both iron deficiency and vitamin B12 deficiency. As she has no conventional risk factors for atherosclerosis and young age of presentation, her serum homocysteine and lipoprotein A (Lp (a)) levels were assessed. Serum Lp (a) was normal and serum homocysteine levels were elevated at 28.48 micromoles/L. She received vitamin B12 and iron supplementation and was started on folic acid for the hyperhomocysteinemia. The patient made a good recovery of her cardiac condition and improvement in anemia with normalization of the hemoglobin, blood pictures and vitamin B12. Her homocysteine level after 6 months of followup showed normal values suggesting that elevated homocystiene level was acquired due to nutritional deficiency of vitamin co -factors. She was advised to continue the started medication and to do lifestyle measures and she was followedup in the cardiology OPD and is doing well on follow up at 9 months. Acute MI in young women in the childbearing age is a rare occurrence. In most of the studies it accounts for 3-12% of total acute MI. Women with acute MI have different risk factor profile, more atypical presentation and different pathophysiology. Hyperhomocysteinemia is an emerging risk factor for coronary artery disease in young people presenting with acute MI. Our patient was a young lady without any conventional risk factors for coronary artery disease (CAD) and presented with acute MI at the age of 32 years. Patient presented with very atypical pain. The character of the pain, age of patient and the absence of typical cardiovascular risk factors should have made diagnosis of acute MI unlikely in this young lady. She was obese and on a very strict diet and exercise program which probably had put her into severe deficiency of many nutrients such as vitaminsand minerals and the hyperhomocysteinemia induced by vitamin B12 deficiency must have led to the development of acute MI. This case demonstrates that hyperhomocysteinemia caused by a nutritional deficiency of vitamin cofactors can lead to MI. Hyperhomocysteinemia can be a risk factor for accelerated atherosclerosis and thrombus formation leading to coronary artery disease. So hyperhomocysteinemia should be considered in the work-up of acute Myocardial infarction in young people and those without conventional risk factors. Clarke R, Daly L, Robinson K, Naughten E, Cahalane S, Fowler B et al. Hyperhomocyteinemia: An independent risk factor for vascular disease. N Engl J Med. 1991; 324: 1149-55. Boushey CJ, Beresford SA, Omenn GS, Motulsky AG. A quantitative assessment of plasma Homocysteine as a risk factor for cardiovascular disease: Probable benefits of increasing folic acid intakes. JAMA. 1995; 274: 1049-57. Welch G, Loscalzo J. Homocyteine and atherothrombosis. N Engl J Med. 1998; 338 : 1042-50. Shaw LJ, Bugiardini R, Merz CN. Women and ischemic heart disease: Evolving knowledge. J Am Coll ardiol. 2009; 54: 1561-75. Al-Obaidi MK, Philippou H, Stubbs PJ, Adami A, Amersey R, Noble MM, et al. Relationships-homocyteine, factor VIIa, and thrombin generation in acute coronary syndrome. Circulation 2000; 101: 372-77. Antoniades C, Antonopoulos AS, Tousoulis D, Marinou K, Stefanadis C. Homocyteine and coronary atherosclerosis: From folate fortification to the recent clinical trials. Eur Heart J. 2009; 30: 6-15. Remacha AF, Souto JC, Ramila E, Perea G, Sarda MP, Fontcuberta J. Enhanced risk of thrombotic disease in patients with acquired vitamin B12 and/or folate deficiency: Role of hyperhomocysteinemia. Ann Hematol 2002; 81: 616-21. Melhem A, Desai A, Hofmann MA. Acute myocardial infarction and pulmonary embolism in a young man with pernicious anemia induced severe hyperhomocyteinemia. Thrmb J 2009; 7: 5. Iqbal MP, Ishaq M, Kazmi KA, Yousuf FA, Mehboobali N, Ali SA et al. Role of vitamins B6, B12 and folic acid on hyperhomocysteinemia in a Pakistani population of patients with acute myocardial infarction. Nutr Metab Cardiovasc Dis. 2005; 15: 100-8.